Dibba is probably the best beach within easy driving of Dubai – about two hours. It is a long sandy beach with a large 30m high sand dune that runs along the edge of the cliffs. At the Southern end the beach is quite wide and open. At the northern end there are the stone remains of several buildings. You have to cross into Oman just half way through the Dibba township. As of September 2012 the process had changed requiring you to provide evidence of a hotel reservation so that we think there was some record of people crossing into Dubai from Oman. We turned up in October and luckily managed to get across but were warned that next time we would not be so lucky. Before September you could quite freely cross over the UAE/Dubai border at either the beach road or on the inland road. If your plan was to camp on the beach this looked like being a problem. Contact me for the answer. 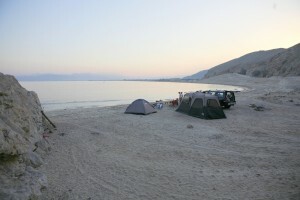 The best place to camp is at the far northern end of the beach beside the cliff face. It is a popular spot so there is plenty evidence of previous campers and day trippers The beach at the northern end is a little rocky at low tide which may suit those who wish to snorkel. 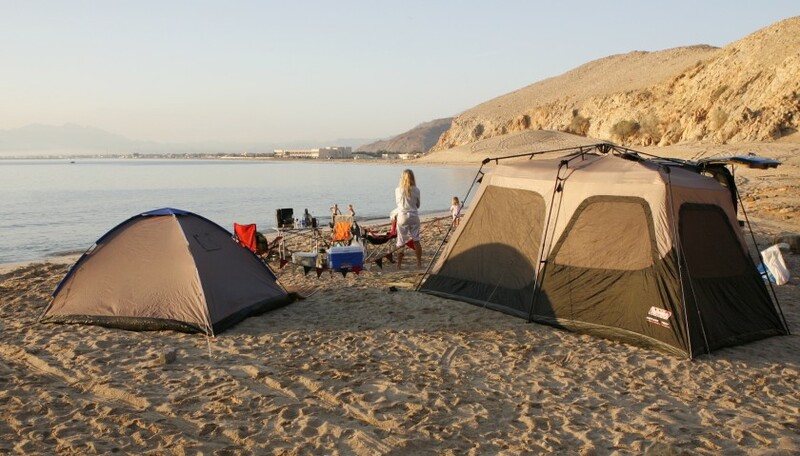 Over the years we notice that there were quite of variety of places to camp from right on the beach, close to the cliffs at the far end or right on top of the large sand dune. The toilet block use to have running water but now seems to be disconnected. The Omani police vist regularly and at night which initially caused us some concern but came to be reassuring after awhile. The best format we came to was two nights stay with lunch at the Golden Tulip on the full day. Most people only stay a night as you need day time cover and lots of water. Dibba harbour with the boat trips to the Oman Fjords round the corner is very close to the Hotel but we did not explore much else in the area. Great article! I want to go and camp there and will appreciate if you can share your tips and secrets with me. Please send me mail. Thanks! Can you pls share with us how to cross the border for night camp. Hi Paul, when they introduced the border controls at Dibba, we booked lunch at the hotel at the other end of the beach. The hotel sent us an email to confirm and we showed this to the guards at the crossing. We’d then have lunch and a swim at the hotel on one of the days we were there – quite nice to have a shower!! It worked for us, but I know how things can change so quickly over there. We miss the camping! Hope that helps. Finding a decent beach in the UAE for camping is near impossible. I ve searched from the stretch between jebel Dana to Fujairah. There are very few beaches, and they are often not tranquil and quiet due to either late night parties or local quads n 4x4s zipping up and don the beach. I used to camp a lot in tranquil and secluded musundam until the border changes. Hi Paul, go a little bit further into Oman – that’s where we had the most spectacular and beautiful camping: from stunning, empty beaches to incredible vistas on Jebel al Akhdar. The beach next to the mangroves in Khor Kalba. But Oman’s our favourite! Hi we are 2 South Africans (pensioners) who have visited Oman previously and enjoyed a day drip on a dhow out out of Dibba. We would like to visit once again, but this time we would like to stay with a local family who offer accommodation for hire. We do not need hotels or campsites. We would like to experience the lifestyle of the local people. Do you perhaps have any information on this type of trip? There are no campsites – it really is true wild camping. We found that camping was a way of meeting locals as we were the only non-local people in the various places we’ve camped. 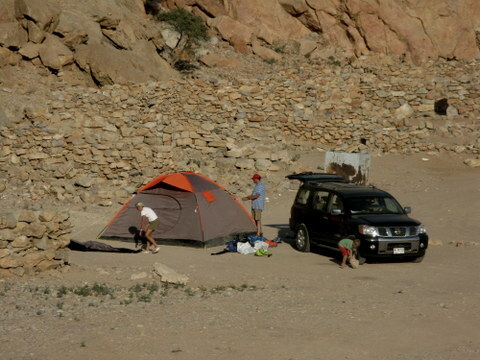 The Omani people are kind, generous, welcoming and particularly fascinated by a British family camping! For accommodation with a local family, I’m not sure, but maybe try Airbnb or homestay.com. Good luck and enjoy Oman, it is a beautiful, unspoilt country.